When the guests arrived at Annagassan Harbour in Co Louth in 1905 for the wedding of Augusta Mary Monica Bellingham and John Crichton-Stuart, 4th Marquis of Bute, at Bellingham Castle, the world of the Edwardian aristocracy must have seemed secure and certain. The wedding party at Bellingham Castle left as they arrived – from the harbour at Annagassan. It was a world that could have inspired Brideshead Revisited – or even Downton Abbey – with titled aristocrats, dowager mothers, Gothic castles, and a family story to rival that of Lady Sybil Crawley in Downton Abbey … the story of Lady Blanche Noel, Queen Victoria’s cousin, who eloped with Thomas Murphy, the Irish-born organist in her father’s private chapel. Even the bride’s elder sister Ida, who had become a nun in the Holy Child Order at Saint Leonards-on-Sea (Mother Mary Emmanuel), was present at the wedding. It was a story I heard about during my visits earlier this week to Annagassan Harbour, Bellingham Castle and the pretty Co Louth village of Castlebellingham earlier this week. But as the wedding party sailed away from Annagassan Harbour, the world of the bride’s father, Sir Henry Bellingham, was about to fall apart and would never be put together again. Within a decade, World War I had broken out and the events were already in train that would lead to the Battle of the Somme and the Easter Rising in 1916. With the death of his uncle, Sydney Bellingham, in 1900, Sir Henry Bellingham, who had inherited the family title in 1889, now inherited the family castle and estate, and was secure in enjoyment of Bellingham Castle and his ancestral lands at the Castlebellingham estate. Sir Henry had already experienced tragedy in his life with the death of his wife, Lady Constance Bellingham, in 1891. She was only 43 and they had been married just 17 years. Perhaps Sir Henry found new happiness in 1895 when he married his second wife, 25-year-old Lelgarde Harry Florence Clifton (born 1872), the younger daughter of Augustus Wykeham Clifton and his wife Bertha Clifton, 22nd Baroness Grey de Ruthyn. But Sir Henry still grieved his first wife, Lady Constance, and in 1902, when the 200-tear-old great royal oak at the castle gates fell in a storm he had it carved for the Calvary erected in her memory at the gates of Bellingham Castle. For a century or more it was a landmark on the main road between Dublin and Belfast. Sir Henry was the father two sons, Edward and Roger. Both sons became army officers and as they celebrated their sister Augusta’s wedding in 1905, they could hardly imagine what was to befall them. Edward Bellingham, who would eventually succeed to his father’s estate and titles, was born on 26 January 1879 and was educated at the Oratory School, London, and the Royal Military College, Sandhurst. In 1899, he was commissioned in the Royal Scots, and then fought in the Second Boer War. During World War I, he was a major in the Royal Dublin Fusiliers. He was wounded and mentioned in despatches three times. His experiences of the gassing at the Battle of Hulluch on 27-29 April 1916 are vividly recalled by the historian Turtle Bunbury here. He was decorated with the Distinguished Service Order (DSO) in 1916, and became a temporary brigadier-general. In 1918, he became a Companion of the Order of St Michael and St George (CMG), and a year later he was promoted lieutenant-colonel. His brother, Roger Charles Noel Bellingham (1884-1915), married Alice Naish in 1910. He became an aide-de-camp to the Lord-Lieutenant of Ireland, Lord Aberdeen, from 1912 to 1914. Like his father, he supported Home Rule and was popular in Co Louth. With the outbreak of World War I, he became a captain in the Royal Field Artillery and probably hoped to return home to raise his young family and to enter a political career in Ireland. Captain Roger Bellingham was 30 when he was killed in action on 4 March 1915. His name heads the list of names on the recently-renovated War Memorial Cross in the centre of the village. It was only 10 years since his sister’s lavish society wedding. The world that seemed secure to Edwardian society a decade earlier had been shattered and would never be put together again. For a while, Sir Henry Bellingham continued to engage in local politics and civic life in Co Louth and the educational life of the nation. A keen supporter of Irish language movements, he remained a Commissioner of National Education for Ireland, a Senator of the Royal University of Ireland, and Lord Lieutenant of Co Louth, an office he had held since in 1911. At the end of World War I, Sir Henry published a letter in the Dundalk Democrat on 8 March 1919, proposing the erection of a war memorial in the village to commemorate those from Kilsaran and Dromiskin who had died in the war. The cross was dedicated on 5 February 1920 by the Roman Catholic Archbishop of Armagh, Cardinal Logue, after a solemn Requiem Mass in the Roman Catholic parish church in Kilsaran. On that day, 200 ex-servicemen marched in military formation under the command of General Edward Bellingham from Kilsaran to the monument. The old order was changing, and nothing would bring it back. At the age of 74, Sir Henry died on 9 July 1921, when the Irish War of Independence was at its height. His funeral Mass in Kilsaran was attended by Cardinal Logue, who led the graveside prayers, and James Macmahon (1865-1954), the last Under-Secretary for Ireland. The family title and the castle were inherited by Sir Henry’s son, the diplomat Brigadier-General Sir Edward Henry Charles Patrick Bellingham (1879-1956), as the fifth baronet. After his father’s death, Sir Edward returned to live at Bellingham Castle. He also succeeded as Lord Lieutenant of Louth in 1921, but was the last person to hold this office, which was abolished in 1922 with the establishment of the Irish Free State. In 1925, Sir Edward was elected to the Senate of the Irish Free State with the ninth highest number of first preference votes nationwide of the 76 candidates, and he sat as a Senator until the Senate was abolished in 1936. At the outbreak of World War II, he joined the Royal Air Force. After the war, he served in the Commission of Control in Germany until 1947. In his last years he was vice-consul at the British embassy in Guatemala. He bred pedigree pigs and Aberdeen Angus cattle. He died in 1956 and his widow, Charlotte Elizabeth, died in 1964. He was the last Bellingham to live at Bellingham Castle. He was succeeded as sixth baronet by his nephew, Sir Roger Carroll Patrick Stephen Bellingham (1911-1973), who was only a five-year-old when his father, Captain Roger Bellingham, was killed in action in World War in 1915. However, Sir Roger never inherited Bellingham Castle, which had been acquired by the Irish Land Commission. Sir Roger was educated at the Oratory School, London, studied medicine at UCD and the University of Edinburgh (MB, ChB), and practiced as an anaesthetist. His son, Sir Noel Peter Roger Bellingham (1943-1999), succeeded as the seventh baronet in 1973. He was an accountant, and when he died in 1999 at the age of 55, the title passed to his brother, Sir Anthony Edward Norman Bellingham, the eighth and present baronet. He is a distant cousin of the former British Prime Minister – they share direct descent from King William IV’s illegitimate daughter, Lady Elizabeth FitzClarence, a first cousin of Queen Victoria. Bellingham Castle remained the home of the Bellingham baronets until the mid-1950s. The castle and the entire estate were bought by Dermot Meehan in 1958 from the Irish Land Commission for a total of £3,065, and he spent several years converting the house into the Bellingham Castle Hotel. Meehan sold the hotel and 17 acres in 1967 to John Keenan for £30,636.61. The Meehan family retained the remainder of the estate, including 70 acres of mature parkland, the coach stables, cottages and the walled gardens. In recent years, Mark Meehan has restored the coach stables to its former glory, planted hundreds of trees and continues to develop the estate. The hotel and those 17 acres, was offered for sale at €1,500,000 in 2011. In December 2012, the Corscadden family, who own and run Cabra Castle Hotel in Kingscourt, Co Cavan, and Ballyseede Castle Hotel in Tralee, Co Kerry, bought Bellingham Castle. Since then, they have renovated the 19-bedroom castle and transformed it into an hotel and wedding venue and it re-opened in 2014. Today, people travelling along the M1 link the name of Castlebellingham with the Applegreen Service Stations near Dundalk, and the village of Castlebellingham has become a much quieter and sleepier place since it was bypassed by the motorway. The village green, fringed by colourful, quaint pubs, is idyllic in the summer sunshine. The war memorial has been restored in recent years as part of the 1914-1916-1918 centenary commemorations. Foley’s Tea Rooms, a quaint coffee shop in a thatched cottage, is hundreds of years old. The Wayside Cavalry commemorating Lady Constance Bellingham is still a prominent local landmark. 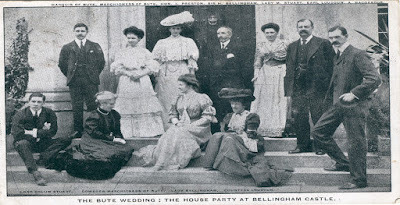 And Bellingham Castle is hosting wedding parties once again, albeit weddings that are less lavish than the society wedding of 1905. But the absence of Lady Blanche Murphy from the wedding of her sister, Lady Constance Noel, and Sir Henry Bellingham in 1874 also told a story of how the values and mores of Victorian society were changing. And that is a story for tomorrow morning [Friday 5 August 2016].